Planet Hunters | Talk | Help | quintuple stars system? Seems like there are multiple star in this system? i find it difficult to read this... what does this make you think of? I'd be curious on someone's opinion on this "star" ... SPH50783666. Just the two stars. This is a probable "overcontact" eclipsing binary. 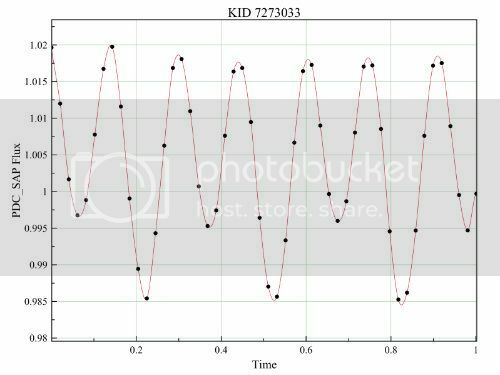 The stars are so close to each other and their orbits so short that the changes in light are happening on time-scales too close to Kepler's sampling rate and so you see a so-called "shutter effect" because the "wave" is poorly sampled. You need to zoom in to see what's really going on. Just the two stars. This is a probable "overcontact" eclipsing binary. The stars are so close to each other and their orbits so short that the changes in light are happening on time-scales too close to Kepler's sampling rate and so you see a so-called "shutter effect" because the "wave" is poorly sampled. You need to zoom in to see what's really going on. Please Log In to make comments.